To enter the virtual gallery, please click here. „…yes, I was born in Vyškov in 1951 Moravia. Well, you know, there is a school accross the street in this small city. Everything was at hand what was very nice. Other things were there for those of us who were cross-country men exactly by the fields. Arts and Crafts Secondary School in Br-no, Academy of Arts and UMPRUM in Prague. Nobody wanted me to paint. I was doing every-thing at UMPRUM except painting. It was unadvisable for moralists from the Academy to allow me to study. Certainly, all of them were looking after my welfare. You cannot put up with it and you keep on painting all stories kept in your head. In the meantime you become an advertising clerk, worker, bridegroom, wood-carver, father, pho-tographer and divorced artist as well. And you keep on painting. You become suspicious to yourself. You think if everybody around you is realy looking for my best intention. So you ke-ep on walking without family with high social ambitions but without a talent to be in the right place at the right time. You keep walking, passing by big pla-ces of showbusiness and shaking your head in disapproval of shallowness of those who used to have a big talent. I think about signs and symbols of personality and character of people, which are recorded deeply in their souls and creat our surroundings and lifelong journey. There are structures and ornaments sometimes hardly legible, they are their own secrets. It happens rarely but it does happen and I can re-ad it from their eyes. It is about stories as complicated as my paintings. 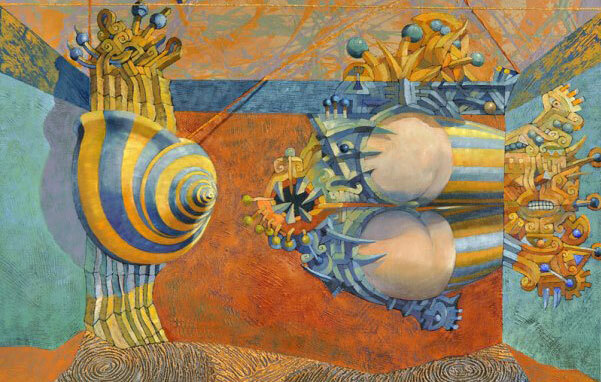 Josef Achrer is a current regularly elected president of the Union of Creative Artists in Prague. 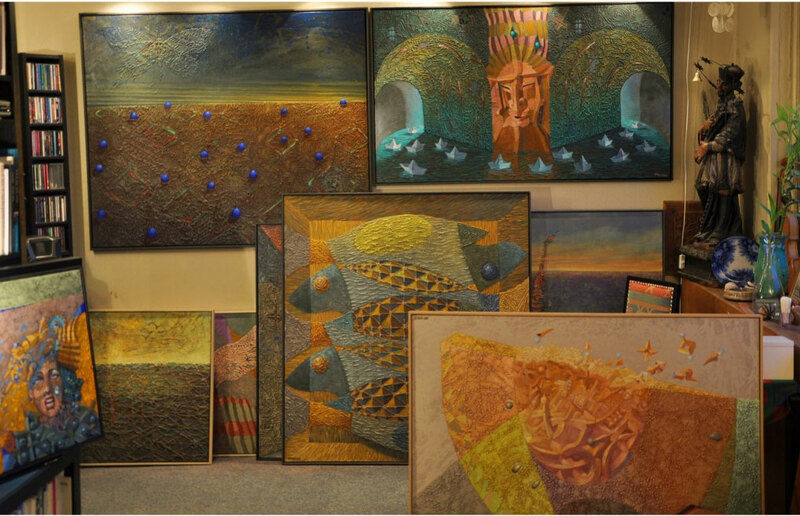 It is the art association established in 1898 by artists gathered round National Theatre decoration. J.V. Myslbek, Prof. F. Ženíšek, V. Brožík, V. Hynais, M. Aleš and others were constitutive members. 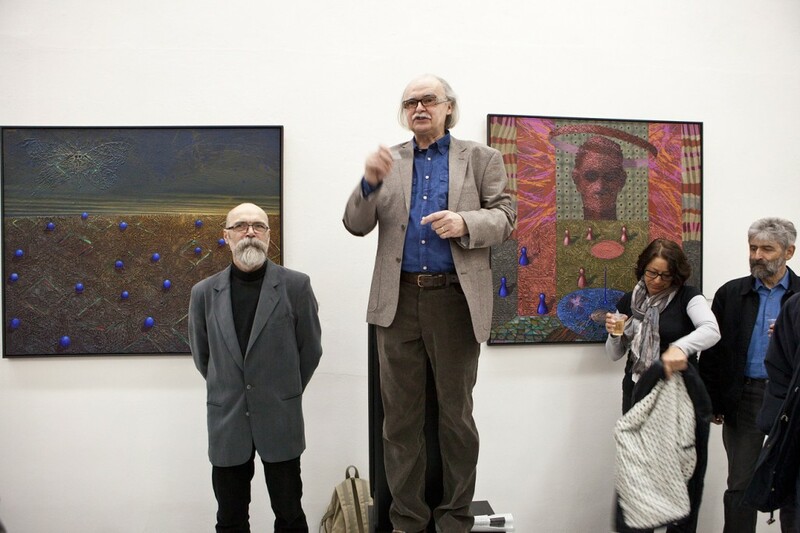 The art association has survived all time periods of Czechoslovak and later Czech Republic to these very days and gathers 57 members (painters, sculptors and graphic artists). Josef Achrer was at a birth of „Compressionism“, which was started by an overpressure of the society. It is a group of 6 members who exhibit together from 4th December 2002 without any relationship, without any direction, without any academical -ism and without any complication of schematics. 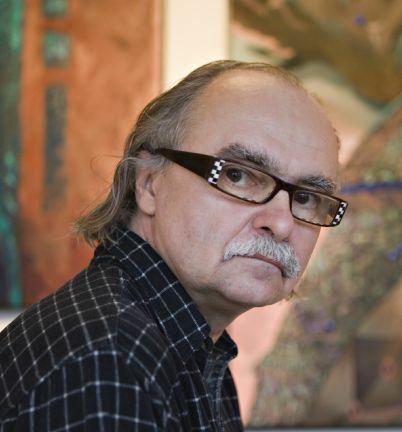 Josef Achrer is a current Art Director of the gallery. 1976 Brno, 1984 Karlštejn, 1987 Rakovník, 1992 Kodaň, 1993 Malmö, 1994 Vyškov n. Mor., 1994 Brno, 1995 Jindřichův Hradec, 1999 Praha, 2000 Praha, 2001 Praha, 2002 Jindřichův Hradec, 2003 Norimberk, 2004 Nová síň Praha 1, 2005 and 2006 Nová síň Praha 1, 2006 Galerie Carpe Diem Praha 3. Common exhibitions which Josef Achrer participated in together with groups, salons, art associations in 30 years of his soft art career the author doesn’t mention.